I'm sorry to lead you astray, dear reader. Unfortunately, the album which I'm referencing in the headline doesn't actually drop for another month and a half. But it's because of this album—or more specifically—this album's teaser trailer that has me ravenously consuming all things Flying Lotus. In the somewhat NSFW video below, Flying Lotus sums up in 2 minutes what he musically does best, which is pretty much everything. The audible chaos has a strange structure and flow, even as the video weaves in and out of the upcoming album's 19-song tracklist. That chaos is equally met with the mesmerizing and brutal images that accompany them. 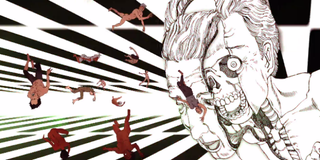 Flying Lotus, aka Steven Ellison, absolutely defies a genre. Is this fusion jazz? Hip hop? Electronica? Rap? Soul? To think someone could be so multifaceted but also not leave you behind in the music's undefined wake speaks to Ellison's skill. Also, the guest appearances on these tracks give you a sense of how much respect he's garnered as he gets vocal and musical contributions from Kendrick Lamar, Snoop Dogg, and Herbie Hancock to name a few.